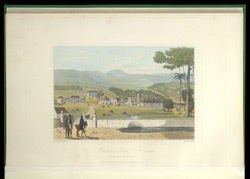 Print of the Montpelier Estate taken from James Hakewill's 'A Picturesque Tour in the Island of Jamaica.' It depicts one of the largest plantations on the island: the 10,000 acre estate of Charles Ellis. Some of the works buildings seen in the picture were built by Ellis' father in 1775. Other buildings, such as a second water mill powered by water from a new aqueduct, were added in 1832.